The plugin for VMware has been improved with new features called VMware View and VMware Manage , also architecture discovery was improved to collect the relationship between all VMware architecture elements and a lot of new checks were added. 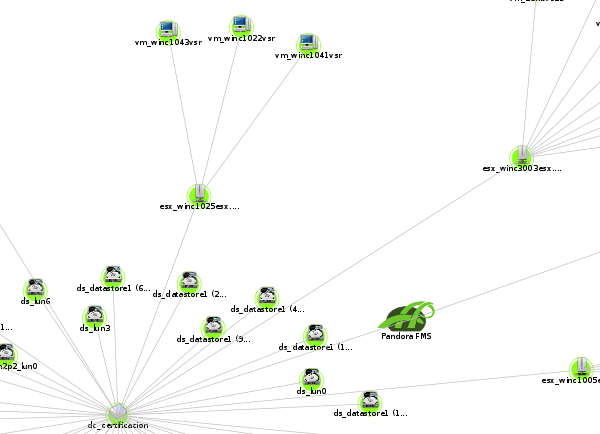 The new VMware View shows all VMware devices and their relations. It allows you to know for example which virtual machine is in that ESX easily. All information is shown in a map like the following picture. With VMware Manage you can control your virtual machines without leaving Pandora FMS Console. This feature allows you to Start, Stop, Reset and Suspend all virtual machines discovered by the plugin. You will find a tab in the agent associated to a virtual machine with the control panel to perform the action you want. You can find more information about VMware Monitoring Plugin at the documentation. Where can i find this plugin as download? In the plugin repository i can only find the vmware 2.0 plugin but i assume that is not the right one. Its only for the enterprise version, you have the opensource plugin to monitor Vmware in our module library. Thanks Nil! Can you contact me regarding the enterprise version? You have my email addy if i'm correct.